A man wielding a knife hijacked a bus in western Norway and killed three people on board, police say. 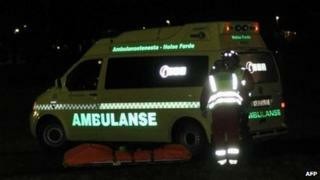 The suspect, in his 50s and of foreign origin, has been arrested, police told the Norwegian Broadcasting Corporation. The victims - one woman and two men - included the bus driver. There were no immediate details of other casualties. The attack took place around 17:30 local time (16:30 GMT) on a remote mountain road near Ardal, about 220km (135 miles) north-west of Oslo. "For now, I have no information to indicate there was anyone else than the three victims" on the bus, police officer Joern Lasse Foerde Refsnes told TV2 news channel. A witness, who gave his name as Leif, told TV2: "The bus was on the side of the road, so we stopped our car and ran over." "It was impossible to open the doors. Then we saw a dark-skinned person inside the bus. At first, we thought he was trying to get out but then saw he was moving around with a knife, and we realised that the situation was quite different," he said. The motive for the attack was not immediately clear, but police said there was nothing to suggest the victims were known to the attacker. The suspect is being treated in hospital for knife wounds, police said. Plans to deploy an anti-terror unit to the scene aboard army helicopters was called off after the suspect was arrested.